Pro Tools HD2 Accel: Considered the industry standard in digital audio recording, it has noticeably superior audio processing which takes place in a series of large computer PCI boards made specifically for HD sound processing. Pro Tools HD 9.0.3. The most advanced audio editing and processing software on the market, Pro Tools 9 allows the total manipulation of song structure, track lay-out, and FRS has it loaded with tons of amazing plug-ins. Mac Pro 8 core dual 3.0 gHz G5 with dual 22″ displays. A seriously super-charged computer with tons of upgraded RAM and loaded with high speed Seagate audio drives. Digidesign 192 Interface (16 analog ins, 8 analog outs): The pinnacle of the Digidesign audio interfaces, responsible for converting sounds into 1’s and 0’s. Apogee Rosetta 800 Interface (8 i/o analog to 192kHz): Another ‘analog to digital’ sound conversion box like the 192 but from the industry leader in analog to digital conversion. Amazing clarity from the sub bass to highest treble tones and up to 6X CD quality sound. Apogee Big Ben master clock: The Big Ben is the mother of digital clock boxes. The Big Ben keeps the digital signal locked so tightly together that it actually polishes the sound (very warmly though mind you). 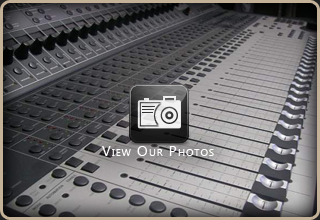 Digidesign / Focusrite Control 24 Console: A powerful ProTools integrated mixing console with 16 built-in Focusrite preamps. Vastly speeds up the mixing process with total automated control. Genelec 1032 A (2) An amazing pair of reference monitors. You’ll never hear music the same after adjusting to these incredibly clear speakers. Tannoy PBM 6 (2) A flat pair of monitors that require more work to make sound “good”. A standard complement to the crystal clear Genelecs.